“Craig was born intellectually impaired but from a very young age showed amazing determination to succeed at everything he tried. Against all odds. 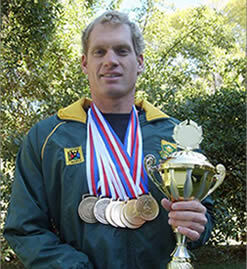 Craig started swimming in 1995 when we returned from Cape Town to Johannesburg. In Cape Town he had spent most of his time surfing and therefore it seemed a natural progression that he would start swimming. The first gala that he swam he came first in 8 events. It was evident that he had talent. Craig went on to take part in Special Olympics in the United States, achieving two gold and one silver medal. This was the beginning of hundreds of medals for him. He went to the Paralympic games in Atlanta and Sydney. Since then Craig has taken part in World Championships every year and has received no fewer than 4 gold medals every time he has taken part. He has won the Midmar Mile 13 times. At the South African Sports Awards he was named Disabled Sportsman of the Year. In 2005 in the Czech Republic he was named the Best Male Swimmer of the World Championships and this happened again in 2009 at the Global Games where not only did he receive this award but he was also awarded Best Athlete of the World Championships given to him by the President of the Czech Republic. Therefore he is acknowledged as the Best Intellectually Impaired Athlete in the world. He has represented South Africa 14 times. Craig currently holds 7 world records and is currently ranked number one in the world in these events. He has been on TV numerous times and he is well-known on the sporting field. Craigs hobbies are surfing, wakeboarding and playing cricket. His role models are Valentino Rossi and Michael Phelps.